I’m no longer of an inclination to drive from Bath to Skye in one go, so I’d booked myself an overnight stay in Glasgow to break the journey. This meant that Friday was spent on an uneventful motorway drive of a little over six hours. The most exciting thing that happened was a rainstorm of biblical proportions near Gloucester, that apart it was just a motorway grind with nothing worth photographing. Saturday dawned bright and sunny and I was away nice and early. The drive along Loch Lomond was a delight because the infamous roadworks are gone. This was where a great slab of rock comes down into the loch and there was just a single width road where there have been temporary traffic lights for the last thirty years! About a month ago the new road was opened there which has been built on a cantilevered section above the loch; a great improvement but thirty years does seem an excessive wait. I like to stop in Tyndrum for breakfast but they weren’t open at the time I drove by so I pushed on and eventually stopped at the Claunie Inn a couple of hours later for my “Full Scottish”. The most popular route to Skye is via Kyle of Localsh but I had decided to ho over the spectacular Mam Ratagan pass to Glenelg instead. 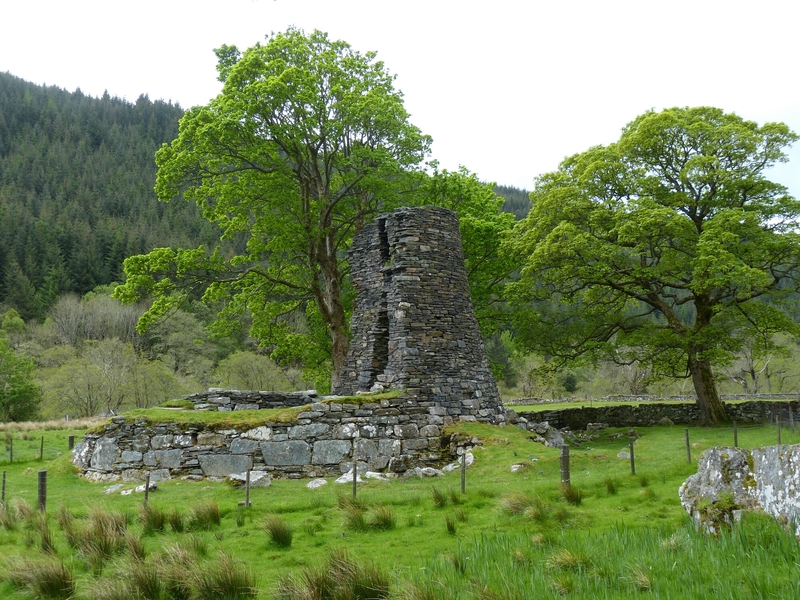 Partly for the pleasure of the drive but also so that I could visit the brochs at Glenelg. Brochs were residential/defensive buildings common in Scotland built about 2000 years ago. Circular of design built of double walled dry stone construction with a thatched roof they were secure and easily defended having a single entrance. 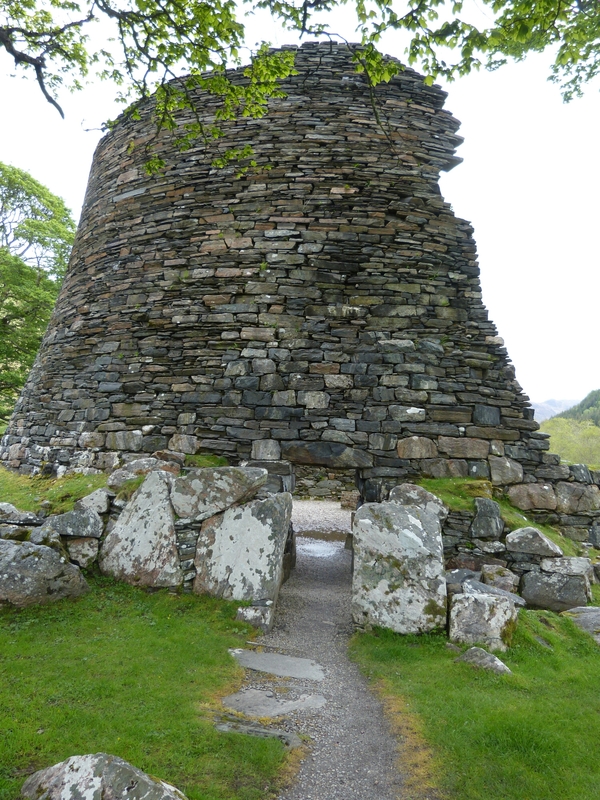 The brochs at Glenelg are particularly well preserved. 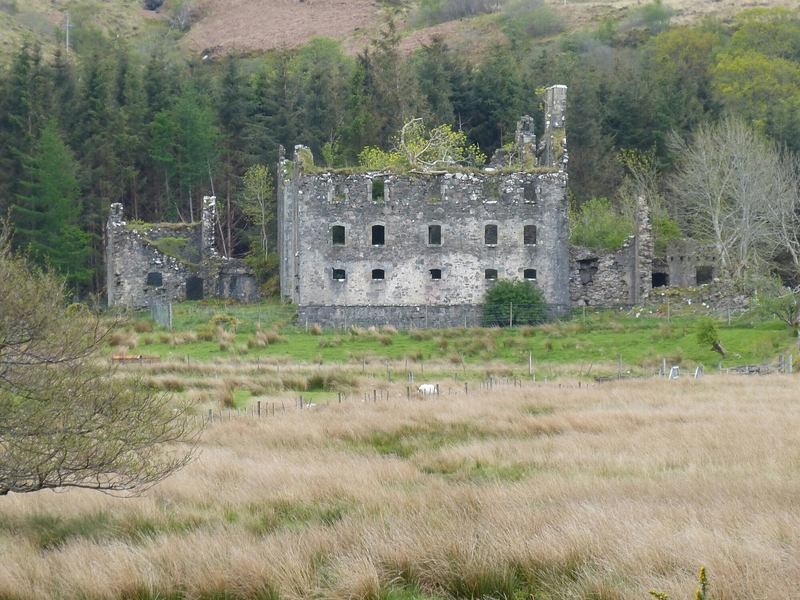 which was one of the barracks built by the English at the time when Scotland was very much an occupied country. Apart from the major garrisons at places like Fort Augustus and Fort William strategic barracks like these were built to fill in the gaps. The other reason for coming this way was to take the Glenelg ferry across to Skye. 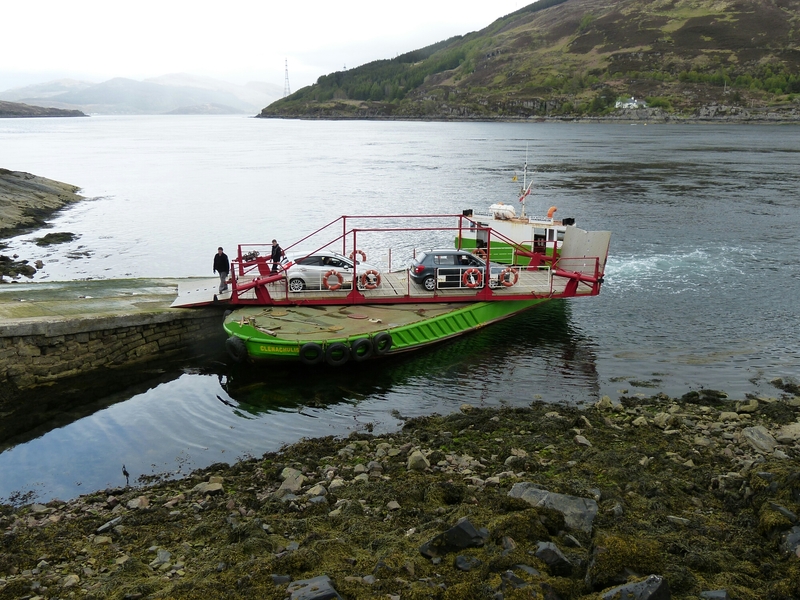 This is one of the last turntable ferries still running and is a much more romantic entry to Skye than the bridge. Needless to say that as I drove on the Ferryman said “oh you’ve just missed the dolphins” but I’m sure he says that to everyone. before a few beers, supper and bed. 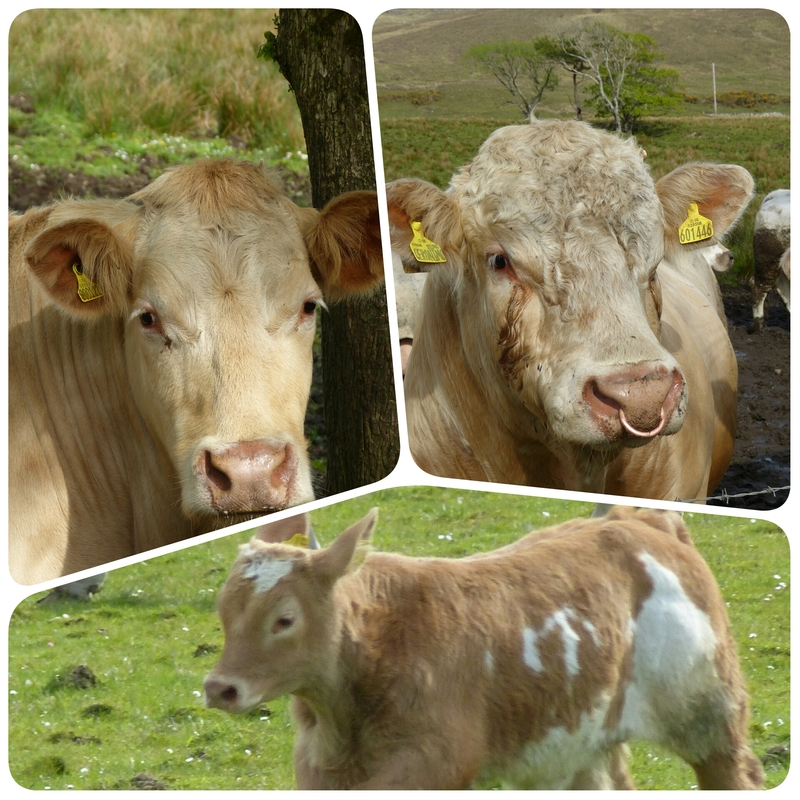 It was a lovely clear evening but the forecast for tomorrow does not look good, typical Skye weather in fact. Thirty years does seem a bit excessive for roadworks! Does the ferry only take two cars? Is that Skye straight across in the photo? I always imagined it further offshore.